He had wanted to do this for a long time. Not because he hated his books, but because he loved them so much. He had labored over them, copying line after line of Plautus and Virgil into the codices that were now his curse, since no matter how much he fasted, wept, or threw himself in the dust, they were there to do what great literature always did—that is, to pick him back up and console him for his human lot. At 43, Jerome didn’t want to be consoled for his human lot: he wanted to be inflamed, inspired; above all, he wanted to be cleansed of the base desires that had tempted him off his path, into the forest of middle age. Like many great readers, he had grown up assuming the world was a book in which he himself played a critical role. But as the years passed it became harder for him to see himself this way. It became harder to think of himself as pure, which was the one thing a Christian hero ought to be. Luckily for him there was still the desert, and the conversions that had occurred there to great men from Jonah to Paul of Tarsus. The message of these transformations (one the early Church embraced) was that no sinner was safe from salvation, no heart so dirty that it might not be bleached by Revelation. But you had to be in the right place. You had to leave Rome—as Jerome finally did in 372, setting out for the Phoenician city of Antioch and the desert that lay beyond it. He planned to immerse himself in these pages until their blankness had rubbed off on him. 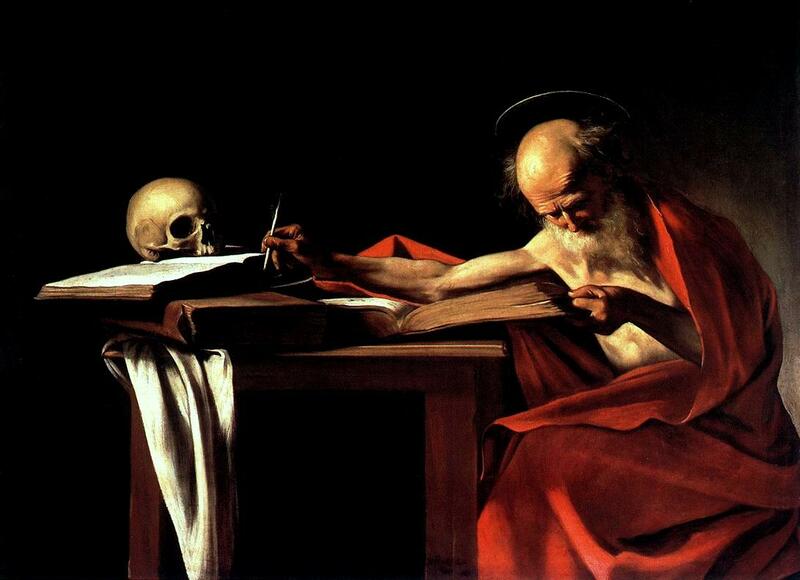 Jerome had no choice but to do what so many saints before him had done: get sick. Midway through Lent, he came down with a fever that “So wasted my unhappy frame that scarcely anything was left of me but skin and bone.” Evagrius made funeral arrangements; but Jerome was visited by a vision in the form of a judge who quoted the Gospel of Matthew. “Thou liest,” this vision-judge said. “You are a follower of Cicero, and not of Christ. For ‘where your treasure lies, there will your heart be also.’” When his fever broke shortly afterwards, Jerome swore that “Lord, if ever again I possess worldly books, or if ever again I read such, I have denied you.” He then discarded his blankets and headed for the desert. Jerome learned Hebrew as a penance: the linguistic equivalent of fasting, or plunging his hand into a nest of fire ants. But there was another, less noble reason for his studies. The Phoenician desert at that time was a magnet for seekers of all kinds, not to mention the many Jewish scholars that called the area home. It was egalitarian in this way, a spiritual wild-west whose saloons had the tendency to erupt, not in gunfire, but in theological debate. Such showdowns were irresistible to the pugnacious Jerome; but they frustrated him, too—for no matter how thoroughly he riddled his opponent with satire or overwhelmed him with subtle logic, he inevitably found himself beaten by a simple point: namely, that the Christian translations of the Bible were bad, and the religion founded on them therefore nothing more than a gigantic misunderstanding. In learning Hebrew, Jerome hoped to gain a weapon he could use against this accusation; but to his surprise, the more he studied, the more he found himself agreeing with his accusers. The available translations of the Bible into Latin were bad—or at least, they were flawed. With few exceptions, they used the canonical Greek Septuagint as their source, rather than the original Hebrew Old Testament. The resulting translations of translations were riddled with errors—a fact that, to a purist like Jerome, was positively terrifying. For if the Bible wasn’t perfect, then how could it be read with any confidence? How could its meaning be established, when the words that made up that meaning had been manhandled by some nearsighted monk, or worse, many nearsighted monks, each of whom had not just compounded his predecessors’ errors but added his own, transforming the once-sturdy House of God into a sort of labyrinth—a sphere (to paraphrase Pascal) whose walls were everywhere, but whose center was nowhere? The scandal of existing Biblical translations haunted Jerome, but in 379—when he left the desert for Constantinople and then eventually Rome—he wasn’t ready to do anything about it. What he could do was start translating, not from Hebrew (he still wasn’t confident enough in his understanding of the language), but from the rich tradition of Greek Christian literature that he’d discovered in Syria. His hope was that doing this would reinvigorate the theological writing of his day, reminding his hair-parsing fellow scholars of those wild Church fathers who had written as uncompromisingly as they’d lived. But communicating their passion turned out to be much more difficult than he expected. It put him in the strange position of having to consider how a “classic” would sound to modern readers. More often than not, it forced him to admit that it wouldn’t strike them, at least not after they read the first few pages and decided to put the book down for something more familiar. Jerome couldn’t bear the thought of failing like this; at the same time he knew the confusion that a bad, or just overambitious translator could perpetrate when he tried to “improve” a text. In his famous “Letter to Pammachius” he described his situation as a sort of riddle: “If I render word for word, the result sounds absurd. If I make any necessary changes in order or wording, I appear to have abandoned the function of the translator.” In order to escape this paradox, Jerome split language into two separate elements: the words in which a work had been written, and the transcendent “sense” behind these words. The literal translator, he explained, attempted to recreate the first of these two elements: an approach not unlike trying to build a replica of the Brooklyn Bridge from its picture in a magazine. But the inspired translator looked past a work’s surface to the spiritual blueprint that had determined that surface, and which could therefore be used to recreate its particulars in whatever language was required. Jerome’s “sense for sense” theory was attacked by critics, but it succeeded with readers, most of whom cared more about their reading experience than they did about whether or not what they were reading was an exact reproduction of its source. If anything, they liked the way Jerome’s feisty commentaries framed the Greek fathers as natural predecessors to contemporary thought, instead of weird outsiders to it. Encouraged by their response, Jerome kept at it, working his way through the homilies of Eusebius and Origen, and amassing a body of translating work that was the toast of Rome—or would have been if he’d still been around to be toasted. But he wasn’t; he was in Bethlehem, the famous but still-tiny village where he’d moved in 385, and where he hoped to achieve at last the two great goals of his life: to found a monastery, and to translate the Hebrew Old Testament into Latin. In other words, he changed it—and not just occasionally, either. Confronted with a language whose norms were literally centuries away from his own, he did what many translators before him had done, and compromised, replacing the Hebrew with a Latin whose refinement and elegance, though impressive in their own right, were in many ways alien to the original. He traded purity of process for purity of result, creating a Bible that he knew wasn’t a perfect reproduction, but which sounded the way he thought the Word of God should sound: that is, graceful, rhetorical. The result was, ironically enough, a distinctly Roman masterpiece—one whose guiding light was not God, or even the Hebrew Old Testament, but those writers of classical Latin that he had repudiated as a young man. The judge had been right. Completed in 405 (a good decade and a half after he started it), Jerome’s vulgate quickly became the most widely-used Bible in Europe. Its success barely slowed him, for despite the reputation he’d achieved as one of the greatest scholars and translators of his age, Jerome remained absurdly productive. In addition to writing commentaries, and translating or editing other books of the Old and New Testament Bible, he worked for the next fifteen years at the various domestic tasks that were necessary to keep the monastery running. One day (or so the story goes) he even went so far as to pluck a thorn from the paw of a lion that had wandered into one of his sermons by mistake—a fact that appears even more amazing when we consider that lions had not lived outside of Africa since at least the Pleistocece era. The grateful beast became the subject of paintings for centuries to come—proof (in many artists’ eyes at least) that sometimes the best way to save one’s home is to invite something wild into it. As for Jerome himself? He died in 420, at the ripe (if not quite Biblical) age of 90. His body was buried in Bethlehem, in the desert he loved, where it remained until the bestowal of sainthood encouraged his admirers to dig it up and circulate its wonderworking members across Europe. His collected commentaries and biographies are considered some of the cornerstones of early Catholic writing. His Vulgate Bible, though superseded for most believers by subsequent translations, is still used in church services, even enjoyed by those readers looking for an example of late Latin writing at its most beautiful. Josh Billings is a writer and translator who was born in Vermont, grew up in Papua New Guinea and Zambia, and currently lives in Rockland, Maine. He has worked as an English teacher and nurse. His translations of Alexander Pushkin’s Tales of Belkin and Alexander Kuprin’s The Duel are available from Melville House Books.